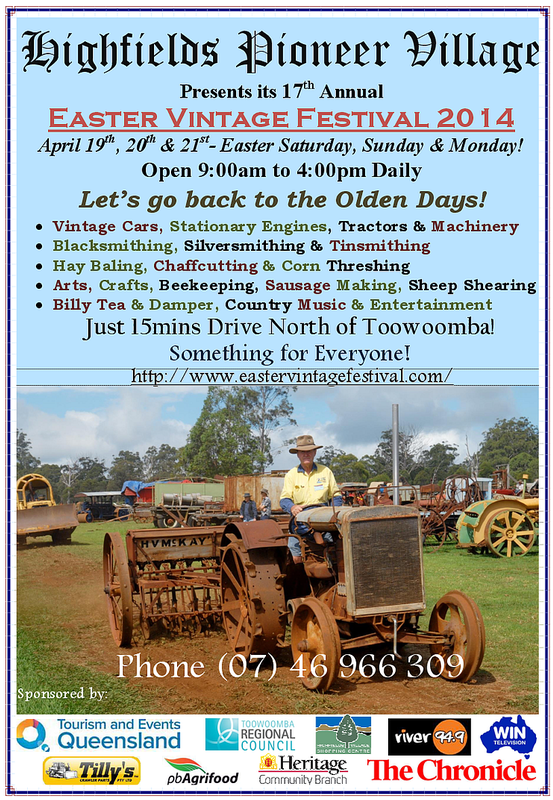 Highfields Pioneer Village is celebrating its 17th Annual Easter Vintage Festival Easter Saturday, Sunday and Monday, from the 19th to the 21st April 2014. The theme of the festival is ‘Lets go back to the Olden Days’. Come and experience rural life in the Australian Pioneer days! Milk a cow, learn how to crack a whip or be a blacksmith. Enjoy billy tea and damper made on authentic camp ovens. Don’t miss the spectacular Grand Parade and all the baby animals in the nursery. There will be live music and great food. You might even encounter the infamous bush ranger Ned Kelly! Whether you love history, you’re a vintage machinery buff or you are just looking for great entertainment you will have a wonderful time at the Easter Vintage Festival. It is an affordable, entertaining weekend for all ages. Past visitors have come for a day and returned for all three! The Festival will feature displays and demonstrations from all aspects of Pioneering life- including arts, crafts, music, vintage machinery and age old crafts such as Silversmithing, Tinsmithing and Blacksmithing. The kids will love to see the old steam engines and stationary engines working and the heavy horses are always a favourite too. There will also be an extensive range of wood products from the Toowoomba Woodworkers on display. Local spinners and weavers will talk about wool usage in textiles and spin wool directly off the sheep’s back. Come and see how the Australian Pioneers survived in bygone years and learn heritage skills. Get back to basics and away from the hustle and bustle of city life and enjoy the atmosphere of the Village set in Pioneering days. Visit the Fashion Shop or the Historic National Bank – be careful you might be held up by Ned Kelly ! There truly is something for everyone at the Easter Vintage Festival, so gather up your family and friends and keep the ‘Australian Pioneering Spirit Alive’- just 15 mins drive North of Toowoomba at Highfields Pioneer Village,Wirraglen Road Highfields, Queensland. The Village is open from 9:00am to 5:00pm each day of the Festival.